Sue & Scot became chefs, housekeepers, groundskeepers, builders and more! 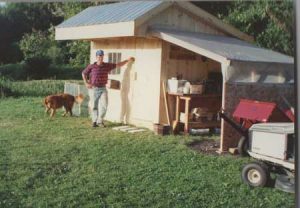 Scott’s first job was contractor/builder/carpenter with a brand new puppy shed for their pregnant golden retriever: Sienna. Sue became housekeeper and chef at the inn, her first recipe was granola that she still serves today to friends and family. Who knew then, that they would go on to build one of the best family-friendly resorts in Vermont? Visit sterlingridgeresort.com to see where 20 years has brought us! Mix Dry: 4 cups wheat germ, 1 pound rolled oats, 2 cups sliced almonds (or other nuts), 1/4 teaspoon salt Mix together: 2 cups honey, 1 1/2 cups water, 2 teaspoo0ns vanilla, 1 1/3 cup vegetable oil Place in large pan, tossing 1 or 2 times, and bake at 350 for 30-40 minutes. Eat, enjoy and think of Sterling Ridge!